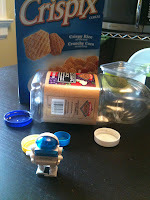 We made our recycling bin robot to be part of an exhibition of robots at Lilla-a-Design. The exhibition is currently on display and there are so many great and different robots in the exhibition it is definitely worth checking out. We begin the project by just talking about robots. I wasn't totally sure how familiar the Bee was with robots, but she quickly reminded me about a little wind-up robot we had that became the inspiration for our project. I then took a bunch of stuff out of our recycling bin and lay it on the table. The Bee selected the large cereal box for the body and a smaller plastic container for the head. 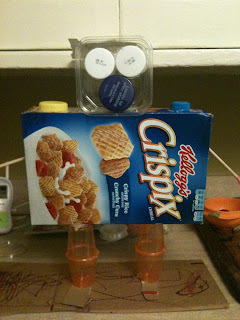 She then choose some plastic caps for the eyes, nose, mouth and the robots buttons. While she did the parts selection i hot glued as instructed. My favorite part of watching her build the robot was that she kept standing up to look at her own body to see what else her robot needed. I had to give her a little help with the legs and suggested gluing two cups together to make legs strong enough to hold up the body. While i finished gluing the Bee spent some time cutting beautiful hair out of paper, it was very important to her that her robot have beautiful hair!